An electric guitar lesson on how to play "Can't You Hear Me Knocking" by the Rolling Stones. This is from their 1971 album "Sticky Fingers." For me, this is one of the Stones best tunes. It really highlights Keith's excellent open G rhythmic style of playing and the jam at the end shows Mick Taylor's great lead playing. Many people think that this lineup was the best version of the Stones. Billy Preston played organ on this track and Bobby Keys played that fantastic sax solo in the end jam. In this lesson I'm going to show you as close as I can , the exact licks that Keith played in the first part of the song even though I'm positive that if the Stones recorded 25 takes of this tune, they'd all be a bit different because they're a jamming kind of a band. I won't get into the jam section at the end. 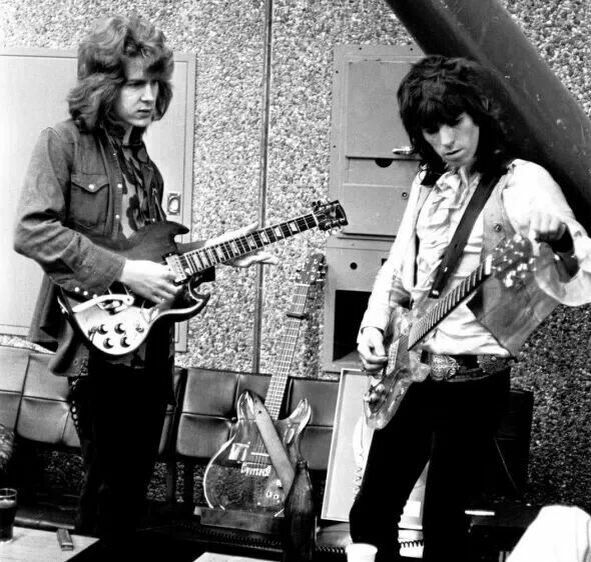 There are two guitar parts in this one, Mick Taylor in the left channel and Keith Richards in the right. Keith's part is in open G while Mick's is in standard. You can see just what a great rhythm player Keith is, very funky and creative. There are a ton of variations in this one and if you want to play it like he did on the record it'll take a lot of work. Learning licks that are similar is always hard as they tend to bleed into each other in your head. Learning this is a really great insight into how he approaches playing guitar. "The jam at the end wasn't inspired by Carlos Santana. We didn't even know they were still taping. We thought we'd finished. We were just rambling and they kept the tape rolling. I figured we'd just fade it off. It was only when we heard the playback that we realized, Oh, they kept it going. Basically we realized we had two bits of music. There's the song and there's the jam." ""Can't You Hear Me Knocking" ... is one of my favorites ... [The jam at the end] just happened by accident; that was never planned. Towards the end of the song I just felt like carrying on playing. Everybody was putting their instruments down, but the tape was still rolling and it sounded good, so everybody quickly picked up their instruments again and carried on playing. It just happened, and it was a one-take thing. A lot of people seem to really like that part."